Discussion in 'Beginner Forum' started by KashCash, Dec 31, 2018. 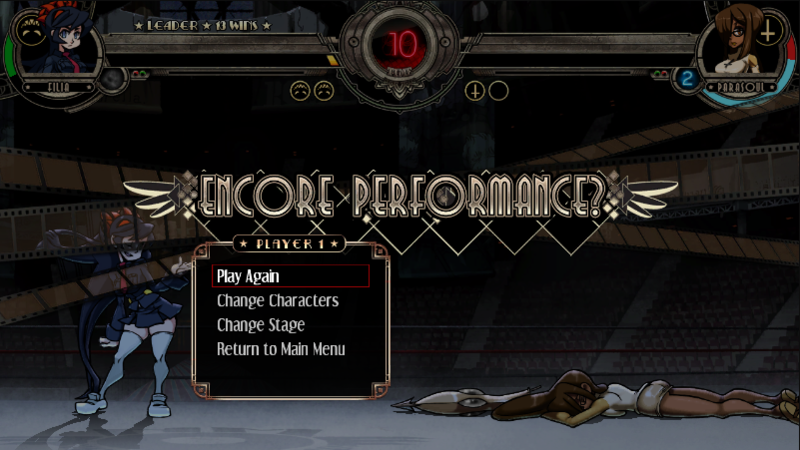 I've gotten Skullgirls yesterday and I quite like it. I'm not completely inexperienced with fighting games, but not a pro at all, so I've been trying to get into training and tutorials first. Not able to get past chapter 2 though, the section of defending against mixups. I'm just not good at blocking at the moment, it seems. I couldn't complete the first combo challenge as Filia, however I did complete some of the inputs and I've been using that to jump off of other combos when I'm fighting a CPU in training mode, so that works at least. Memorized the button combo, but it never seems to execute the way it's supposed to go. 1) How do I get better at blocking? It's always the very hard mix ups that I'm not good at. 2) I'm only practicing with one character (Filia) at the moment, but I know the game goes up to 3 on 3. Should I be practicing with other characters as well? Or should I just focus one characters as individuals, then go into how the assist gameplay works later? For reference's sake, I should say that it seems to be similar how MvC2 works, which I have played a couple of times before, but I'm aware that not every fighting game is the same. 3) Trivial, but is there any way to have the move list open during training mode while I'm fighting? Pausing to read up on moves isn't gelling with me when I have to go back, I find that i need to have them next to me to try to get them. Thanks in advance, hope I don't sound too dumb. 1) Start with the general rule of thumb to block low when they're on the ground and high when they're in the air, throw if there's a conspicuous gap in their pressure. With more experience you'll start to recognize the exceptions to look out for and when players tend to use them. Defense is something that takes a long time to get truly good at and there's no real shortcut to developing intuition and pattern-recognition. 2) Play whatever you feel comfortable with, really. There's no right or wrong answer here, and there's no time limit for learning. 3) Run the game in windowed mode, open a browser next to it with the move list. OK, I've been able to get past the blocking tutorial as of this writing. I feel like I'm getting better with Filia, though I'm not really able to consistently do showstoppers or blockbusters or anything. I'm not able to really memorize the moves yet, and viewing them in the pause menu still isn't intuitive for me. I've tried to move on to practicing with 2 characters, but of course I'm worse with Squiggly since I just started using her. I'll likely still use her, but Fillia will be my first main. I've had some online matches, and they kept me on my toes, but I'm proud at how I was able to block some mixups, even if I didn't win. I feel like I'm more in control of my victories, and when I fail, it's my fault. I'm always eager to fight more though. My current state is that I've been going through aggressive training with Fillia to get used to some stuff. I can reliably pull off certain moves and I'm used to HARD CPU as I feel like it gives me a good challenge, but I can reasonably win as long as I don't lose my focus. This was one of my better quick match runs, some were closer than others but overall I won 13 matches in a row. I haven't beat arcade mode yet, the final boss just confused me. The 1 life so to speak is a bit annoying to deal with as well, so I'm not touching story/arcade mode until I get better. I still don't get how to do some of the big finishers on a consistent basis, like showstopper or blockbuster attacks. I'm getting my terminology mixed up for sure, but I've never been able to memorize names or anything. I just experiment, train, and learn with muscle memory. I will say having a Vita is great for Skullgirls on the go, especially since my hacked vita can use my DS4 as a controller. I can use the same layout on the go or on my computer, and I like that a lot.